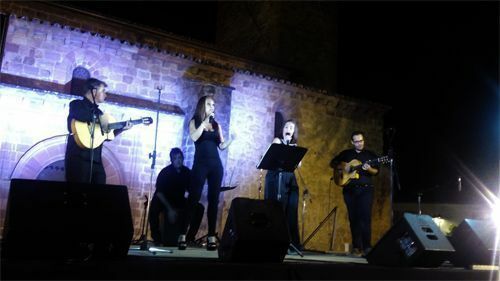 These three artists present a lively show with their guitars and tambourines, performing a very varied repertoire of “sevillanas”, “rumbas” and songs. Four artists who present a lively show, specially “rumbas”, with guitars, tambourine and Latin percussion. They transmit joy to the audience and their rhythm invites and encourages them to dance. The performance lasts 45 minutes. When spring arrives, “Triana” (Seville neighbourhood) becomes a continuous funny and happy festivity which shows the open and kind character of its people. That is what we present so that the guests can enjoy it. 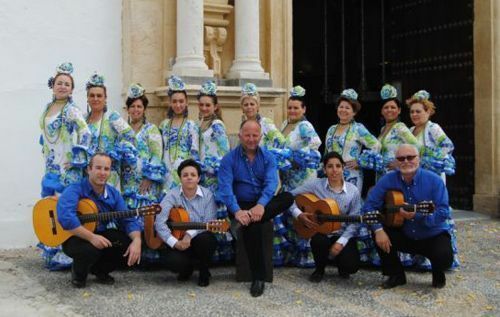 A “Rociero” Group singing “Sevillanas”, “Rumbas” and songs while ten female flamenco dancers invite and encourage constantly the audience to be part of the party and dance with them. A total of fifteen artists make the end of the show unforgettable. They do two passes of 45 minutes each. They need stage and sound system. 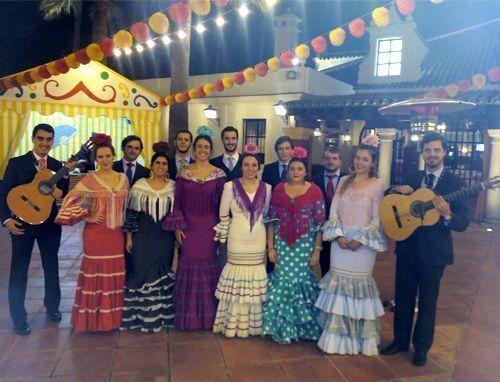 A choir made up by 12/14 artists who, dressed in their colourful “trajes de faralaes”, perform popular songs of Andalusia such as the typical “sevillanas” and “rumbas”. It is an ideal show for providing entertainment for a welcome cocktail of any event or to round off the evening because, apart from singing, they dance among them and with the audience.